Cut the sirloin steak into long thin strips. Heat a large wok or sauté pan with the oil and add in the sirloin strips. Cook quickly for 2-3 minutes until the sirloin strips are browned. Season lightly at this stage. Add in mushrooms, onion, pepper and broccoli and cook very quickly for a further 3-4 minutes until they have softened. To prevent the stir fry from burning add in a couple of tablespoons of water. Next add in soy sauce and honey, and mix well until fully coated. Heat a large pan with 1oz of butter. Add in the noodles and mix well. Season lightly and ensure that they are sufficiently heated before serving. 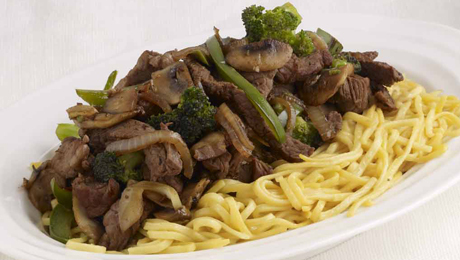 Serve the beef stir-fry on top of the buttered noodles on a large plate. Why not substitute the beef with pork, duck or chicken.